Virginia's Tiebreaker Draw Is Postponed; Pivotal Race Still In Doubt : The Two-Way "Drawing names is an action of last resort," elections board Chairman James Alcorn said, after a new legal challenge in the race that's expected to determine control of the state Legislature. The result of the race between Republican incumbent David Yancey and Democratic challenger Shelly Simonds is still in doubt. 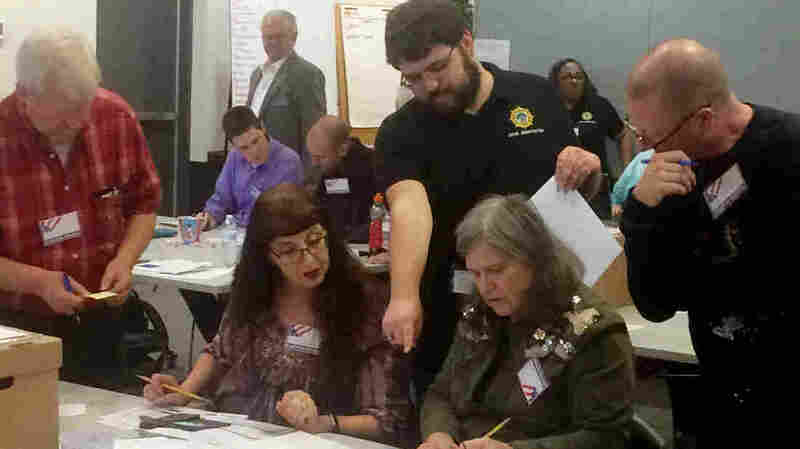 Here, election officials in Newport News, Va., examine ballots that a computer failed to scan during a Dec. 19 recount for their House of Delegates race. The Virginia State Board of Elections has postponed a drawing that would have broken a tie in the state's recent election, after Democrats asked a court to review the awarding of a single vote that left the tally even rather than wresting the House of Delegates from Republicans' sole control. "Drawing names is an action of last resort," elections board Chairman James Alcorn said. And with new court procedures underway, he said, other options are still available. The new twist comes one week after a three-judge panel — which had been expected to certify the victory of Democratic challenger Shelly Simonds via a recount — decided instead that a single uncounted ballot should go to Republican incumbent David Yancey. That left Simonds and Yancey in an even tie, with 11,608 votes. In her legal challenge, Simonds is asking for a court review of the decision to certify the tied vote. The outcome could decide whether Republicans control the Virginia House with a one-seat margin or must share power with the Democrats. While defending the propriety of the drawing that had been scheduled for 11 a.m. Wednesday, Alcorn said, "Neutral election administrators should not be choosing election winners — or influencing the next speaker of the House." Alcorn added, "Any substantive concerns regarding the election or recount should be resolved before a random drawing is conducted." "On the ballot in question, the voter had picked Republican candidates in statewide races. For the 94th District, the voter filled in the bubble for Yancey and the bubble for Simonds. But he or she also drew a single slash through the bubble for Simonds. "Yancey's attorneys argued that the ballot was clearly a vote for Yancey. Simonds' attorneys disagreed. "The court ultimately counted the vote for Yancey, which brought the tally to 11,608 votes each." Before the recount, Simonds had been trailing Yancey by 10 votes in the 94th House district. Theirs was one of several hotly contested races in Virginia's November election, including the 28th District, where an 82-vote Republican win was certified despite state officials' findings that 147 people in the 28th and a neighboring district had voted in the wrong races. As NPR's Richard Gonzales reported last month, "No one knows how that happened, and the person who might best have a clue to the mystery, the registrar, died in April of this year."